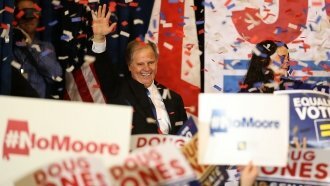 Alabama election officials certified Democrat Doug Jones on Thursday as the winner of the state's highly watched U.S. Senate election. Jones pulled off a massive upset in mid-December, edging out former Judge Roy Moore. The Republican faced multiple sexual misconduct allegations in the month before the election. But Moore wouldn't concede. On Wednesday, he filed a last-minute legal complaint alleging election fraud. Moore lost the race to Jones by a margin of 1.5 percent — just under 21,000 votes. That margin is too wide for an automatic recount. But Moore's complaint wasn't enough to postpone the certification process. Jones will be sworn in to the Senate in January. He's filling the seat vacated by U.S. Attorney General Jeff Sessions. Alabama judge Johnny Hardwick rejected Moore's lawsuit shortly before Jones' certification.